Once again I have been asked to be guest designer for Sunny Challenges. This week is just a sketch challenge which you can make as simple or complicated as you like. 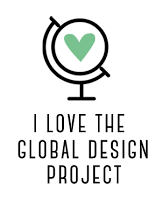 Make sure you head over to Sunny challenges and check out the sketch and the inspiration of the design team. Sunny challenges have included a sketch and the instruction to use products from the Holiday mini. As I bought all my Christmas supplies this year from the mini and had quite an assortment to choose from! You can't tell from the photo, but the middle panel of dsp is actually flocked onto clear acetate. I normally avoid inspiration challenges as being too difficult for me. But this one from Nicole is so easy for Christmas that I had no problem coming up with something. My kids instantly recognised the stripes as being a candy cane and hubby likes this card best of all. I think because it is so much simpler ( no ribbon!) than the others, lol. The ladies at Sunny Challenges decided on a shaker card for this week's challenge. This is my first shaker card and although a bit fiddly not really that difficult. Unfortunately it hasn't photographed very well and you miss out on the scent of the vanilla embossing powder! This week Nicole's Festive Friday challenge is to use the Simply Scored tool. I decided to use it to create a card of a different shape called a 'centre step' card. I have covered the tree with crystal effects and then sprinkled with dazzling diamonds glitter to be all sparkly. I am not sure if it photographs to be able to see it. I haven't been feeling well the last few days and I am hoping that being in my craft room will help. It has been awhile since I have done a challenge from Just Add Ink, but I really liked the sketch this week, so thought I would give it a go. My good friend Rhonda is here stamping with me today, so I got her to do Nicole's Festive Friday challenge with me too. As she doesn't have her own blog or other photo posting site, I have created a post for her to show off her card. I have been following this blog for a while, but this is the first time I have entered one of Nicole's challenges. This week is a colour challenge making a Christmas card. Check out the challenge at Nicole's blog. The lovely ladies at Sunny Challenges have once more asked me to be a guest designer for them. Something I am always honoured and willing to do. This week along with the sketch there is a technique part to the challenge, Triple Layers or Split layers. I found a number of different names for this technique, which is much easier than it looks. And, of course, I am still in Christmas mode as I try to get all my cards done by the 1st December. I am in full Christmas crafting mode this week as I get ready for my Christmas themed workshop on Friday night. I still haven't decided on the make and takes but this card may just be one of them! As soon as I saw the sketch from Sunny Challenges I knew what I wanted to do, so this card came together very quick. I have used the new Core'dinations cardstock with a new embossing folder. Unfortunately it didn't photograph very well to show you the differences in the colour, but I love the distressed look it gives. I was so pleased to be asked to be a guest designer again for Suuny Challenges! I love this sketch and the technique of using baby wipes and reinkers which can be found here. Make sure you head over and have a go at the challenge yourself and leave lots of comments for all the creations. I have been a bit busy lately finishing my workbook for TAFE that I haven't had a great deal of time in the craft room. What little time I have had has been spent on projects which I can't show you just yet. Yesterday I did manage two cards for challenges. This is for Sunny Challenges which included a sketch and in colours. The paper was a hostess set from last year's catalogue so is now retired, but fit perfectly. I love this week's sketch from Stamping 411 challenge. I have tried to do a bit of vintage on a male card, although I think just changing the colours could make it more feminine. My hubby thought it was pretty cool so I guess I succeeded! I have used the mahogany ink from the distressing kit to change the colour of the stamped collage layer from whisper white to brown. A couple of weeks ago I received an email from Vicki at Sunny Challenges inviting me to be a guest designer for this week's challenge. An honour I was willing to do, even though I was a bit nervous at the thought. So here is the sketch and the instructions are to use in colours. So make sure you take a look at the Sunny challenge blog and join in the fun! This week's Sunny Challenge has taken me a bit outside my comfort zone (the whole point of a challenge I guess!). The idea is to put a window somewhere on the card so that you can see inside the card. For me that meant a single layer card only, something I really struggle with. I do like lots of layers! But I think this one looks really pretty. You can't see it in the photo but I have glittered all the 3d flowers and it sparkles lovely in the light. I have combined two challenges for this card. 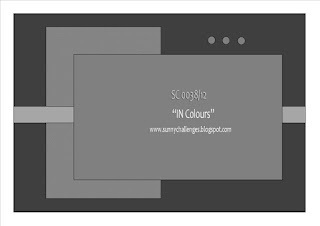 The Colour challenge from Just Add Ink and the sketch is from Sunny challenges. I even got to use one of my new stamps for the sentiment. This one is for my husband Matt as we celebrate our 12th Wedding Anniversary today! The sketch comes from Stamping 411 sketch challenge. I have used my new Simply scored board to create the rosettes, the hardest part was getting them to stick to the backing circle. I found crystal effects as a glue works best. Accessories: Well Worn dsp, clear embossing powder, neutral and regals buttons, circles #2 die, crystal effects, simply scored tool. The new Autumn Winter mini catalogue is now available. 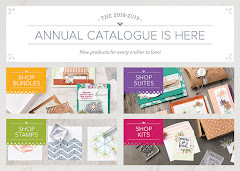 You can view it on line at the Stampin' Up! website or access it through the image in the right margin. Or better still I can send you a copy! Call or email me for your own catalogue. It has been forever since I got the chance to do any kind of creating, but the sketch from Sunny challenges was too good to miss.